My heart is grateful for what I have, I have it because God gave it to me and all things belong to Him. Money and wealth are not an idol in my life. To God belongs the first place in my heart. The gospel is important to me and I want to support the church so others can know the truth. For these reasons the Christian should give joyfully. The Bible says that our attitude is very important when we tithe and offer. Jesus says in Luke 11:42 that those who tithe but do not practice love and justice are hypocrites. And in 2 Corinthians 9:7, Paul says that God loves the cheerful giver. Love and joy make tithing and offerings gifts of worship to the Lord. The blessings that come to the giver are also incentives that God uses so that the believers take care of each other. We often read the importance of giving to those in need. The best example we find is in the first church in Acts 2. What does the church do with tithes and offerings? The church is supported by the tithes and the offerings of the brothers. We need to understand that the Church is not a business where one pays for the services that we receive. Rather, it is a community where members take care of themselves; contribute to their community, and work to bring the gospel to others. The church has expenses to meet like: maintaining a building, paying utilities, buying office supplies, Bibles, food, etc., and rewarding those who care and work full time in favor of the congregation like the pastor. God expects His people to take responsibility for looking after His House and the work that needs to be performed. With strong words, God said through the prophet Malachi, “Will a man rob God? Yet you have robbed Me! But you say, ‘In what way have we robbed You?’ In tithes and offerings. 9 You are cursed with a curse, For you have robbed Me, Even this whole nation. 10 Bring all the tithes into the storehouse, That there may be food in My house, And try Me now in this,” Says the Lord of hosts, “If I will not open for you the windows of heaven And pour out for you such blessing That there will not be room enough to receive it” (3:8-10). According to this passage, God warns and blesses generously those who are committed to take care of the work of His church. Tithes: As the name says, tithe refers to setting aside 10 percent of the total proceeds to regularly give to God. 10 percent is the traditional sum and is traced back to the Old Testament, but the Bible speaks of blessings for those who give generously (or more than required), even if they are poor. Normally a person puts aside 10 percent of his salary weekly or monthly to give to the church. Offerings: Is a special gift. It is regularly made in addition to tithing and with special motives. For example, if the church wants to give Christmas gifts to needy families, it may ask for an offering to cover these expenses. Offering from time to time does not replace the commitment to tithe. Are there rules for tithes and offerings? Absolutely! We read in the passage of Malachi that integrity is required. The example of this we have in Acts 5 with the unfortunate story of Ananias and Safire, a couple who was not sincere in giving. They sold a property, but knowing that they should take the entire offering for the disposal of the work, they kept some of the money. When the Apostle Peter, led by the Holy Spirit, asked them to account, they lied and died on the spot. God does not care about the quantity itself, because not everyone has the ability to give the same amount. Each one will bring offerings, as the Lord has blessed, says Deuteronomy 16:17. What God seeks is the act of love and reverence behind the offering. This was the difference between the offerings of Cain and Abel. Cain gave because he considered it an obligation, in the negative sense. Abel, not only gave his offering to God with joy, but made sure to choose the best. Abel gave with the intent to please his Creator. In the New Testament Jesus used a poor widow, who only had coins of little value, as an example of a just offering before God. It is found in Mark 12:41-43, “Assuredly, I say to you that this poor widow has put in more than all those who have given to the treasury, for they all put in out of their abundance, but she out of her poverty put in all that she had, her whole livelihood.” A person can not give in this way without having the conviction that God is faithful to those who truly love Him. What are the blessings to those who tithe? 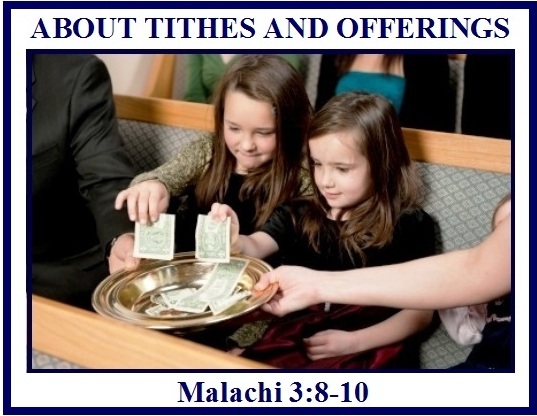 To understand more about tithes and offerings click on the following link: WHAT IS TITHING?